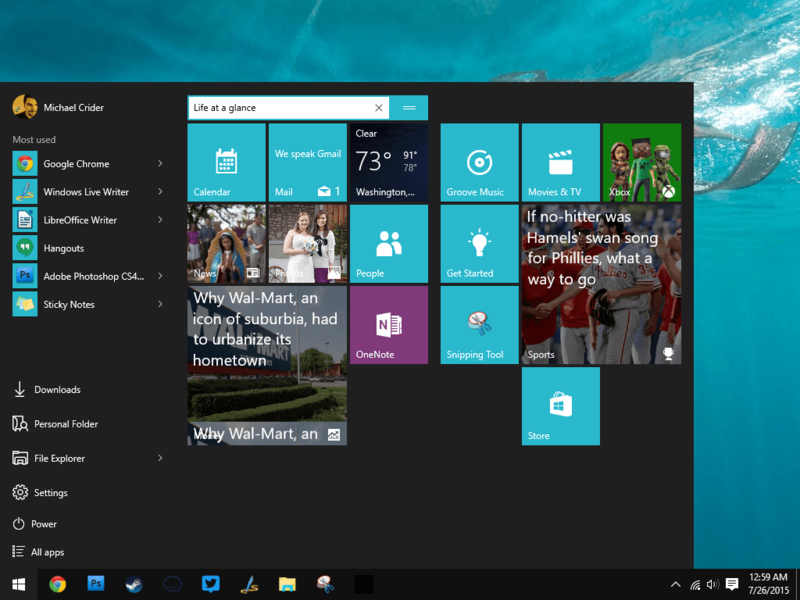 The Start Menu in Windows 10 combines elements of the simple menu-based lists of Windows 7 and earlier with the finger-friendly design of the full-screen menu from Windows 8. While this combination is effective and versatile, it can take some getting used to. There’s a lot of different customization options, much more so than any previous version of Windows. 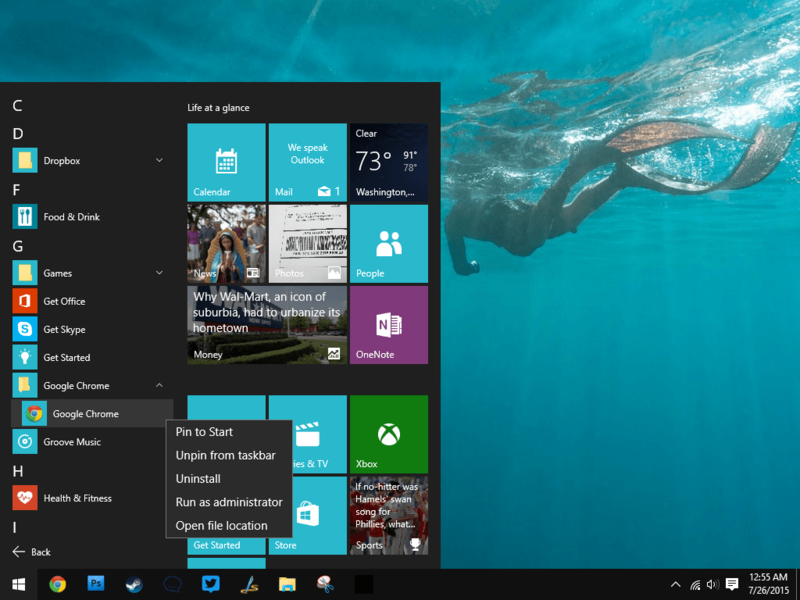 This guide will tell you everything you need to know about the new Start Menu. 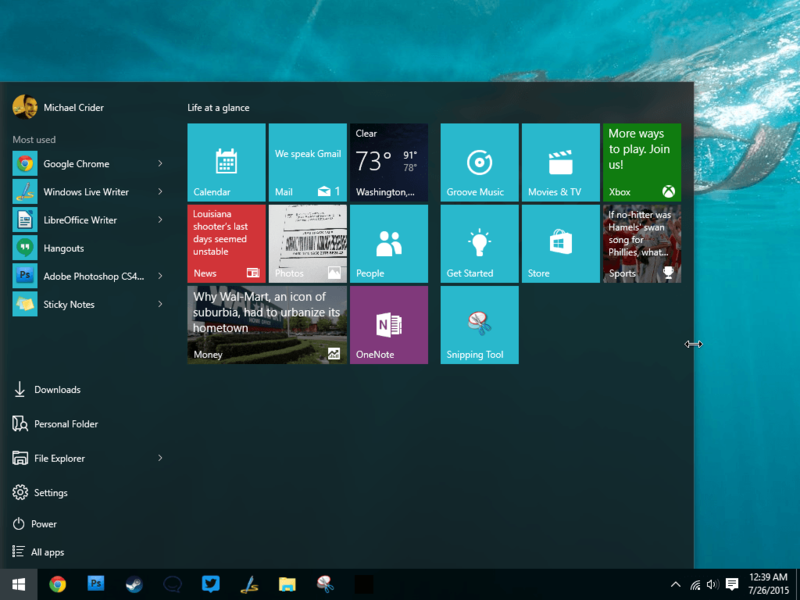 The new Start Menu is comprised of two parts: the primary program and settings area, a vertical list on the left, and the live tiles area, the Windows 8 portion of the menu on the right. Neither area can be disabled (at least as of the Windows 10 launch) but both can be resized. To resize the Start Menu, move your cursor over the vertical or horizontal edge, click, and drag, just like most Windows programs. Making the menu larger vertically will give more space to the list and the live tiles area, while adding horizontal space will only extend the Live Tiles. 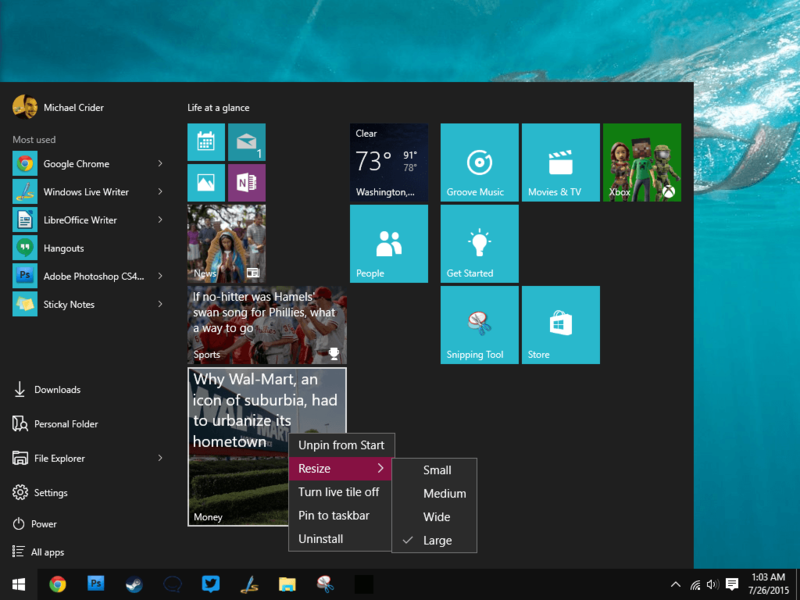 At its smallest horizontal setting, the Start Menu can only handle three “medium” columns of the smaller live tiles, but at its maximum setting it can fit six. 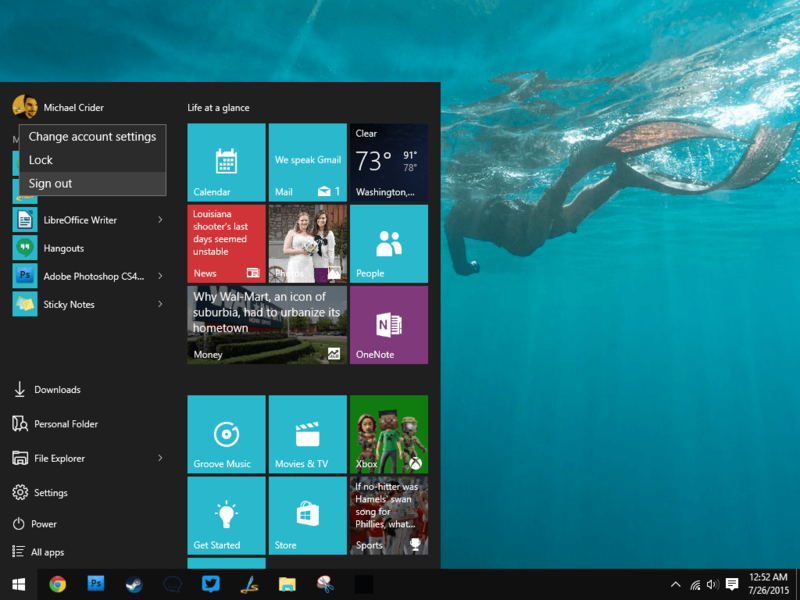 If you actually preferred the full-screen Start from Windows 8, you can get it back in Windows 10. Right-click an empty area of the desktop, then click “Personalize.” Switch the “use” Start full screen” option to “on.” Now the live tiles area will take up your entire desktop (which is handy for touchscreens). While you’ve got the Personalization menu open, check out the other options. These toggles let you select whether to show the most-used apps (which will dynamically change as you use your computer), recently-added apps, or files and actions that you’ve clicked or tapped in Jump Lists. Click “Choose which folders appear on Start.” From here you can enable or disable a link to the File Explorer or the primary Settings menu, plus the specific folders for your primary account folder, personal documents, downloads, music, pictures, and videos, and the HomeGroup folder and Networks settings page. Click the “back” button or press Backspace, then click on “Colors” in the left navigation area. 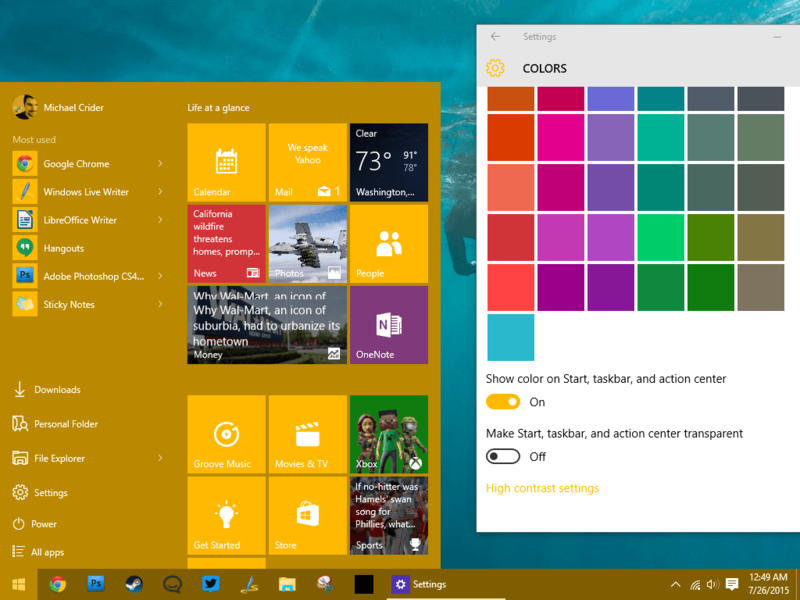 On this page you can select your accent color, a contrasting color that stays constant across all of Windows 10. By default the accent color is chosen automatically based on your desktop wallpaper — if you like the way Windows looks now, just leave it as it is. If not, set “Automatically pick an accent color from my background” to “Off,” and manually select one from the palette that appears. By default the Start Menu and taskbar are translucent black. You can manually color these elements as well by clicking “Show color on Start, taskbar, and action center,” and you can make them opaque by enabling “Make Start, taskbar, and action center transparent.” All of these settings are applied immediately, so click the Start Menu to see what they do and set it up just how you like it. The left side of the Start Menu is similar to what you may remember from Windows 7 and before. Once you’ve selected your folders in the steps above and chosen whether or not to show your most-used apps, there are only two things to check out: the account button and the “all apps” list. Click the account button (the area at the top with your portrait and user name) for a quick link to lock the computer, sign out, or open the Account Settings section of the Settings menu. Now go down to the bottom of the list and click “all apps.” This will give you an alphabetized list of all the programs installed on Windows, including both built-in tools and the programs you’ve installed yourself. Note: Unlike previous versions of Windows, there’s no way to remove or rearrange items on this list, except by uninstalling programs. Right-click any item and you’ll open the context menu. 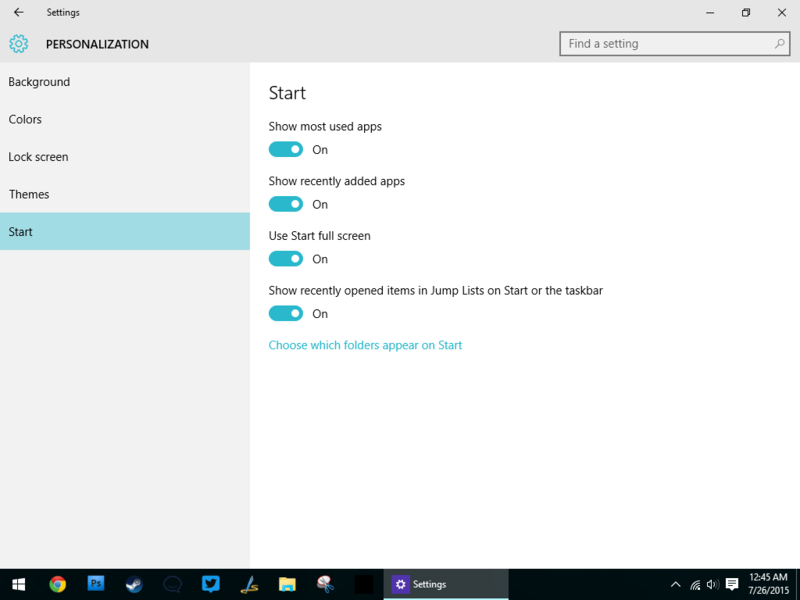 Programs can be pinned to the Taskbar or the live tile section of the Start Menu, just like in Windows 8. Most programs, including some of the new Universal Windows apps, can be directly uninstalled from this right-click window. If the list entry is just a folder or a shortcut, you can open its location in Windows Explorer. 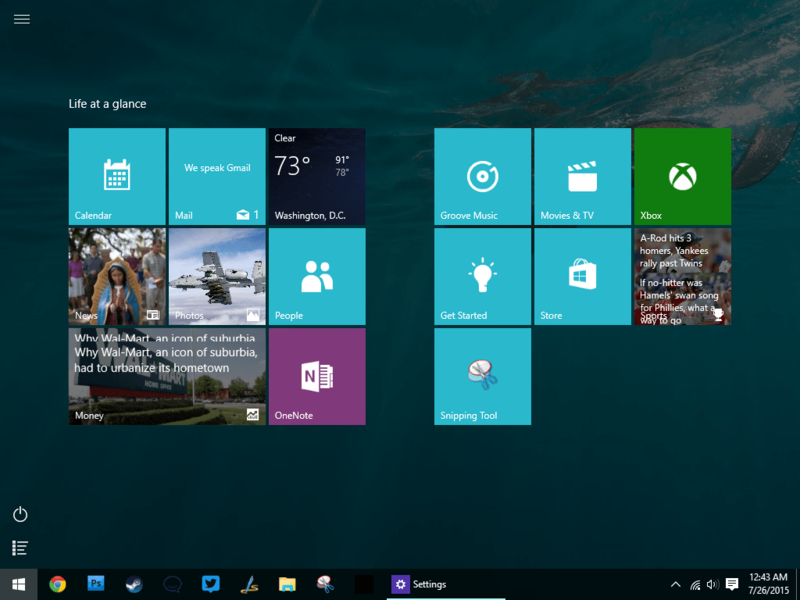 Live tiles are very similar to their Windows 8 implementation. Each tile can be dragged and dropped to a new spot in the Live Tile area, and groups of tiles can be re-arranged, renamed, or deleted. By default, the Live Tile area includes two sub-sections: “Life at a glance” and “Play and explore.” To rename these sub-sections, hover your mouse over the title, then click the two horizontal bars that appear on the left. From here you can directly edit the title or click the “X” to remove it. To resize any live tile, right-click the tile and click “resize.” The default size is “medium,” which takes up one square space on the Live Tile area. It’s also the smallest size which allows a live tile to still animate. “Small” tiles are one fourth the size of “medium” tiles, and you can fit four shortcuts into a single square on the Live Tile area. “Wide” tiles are 2×1 rectangles, twice the size of a medium tile. These are useful for frequently-used programs, or for animated live tiles with longer text elements, like News. The “large” setting takes up four square blocks, four times the size of the medium tile and sixteen times the size of the small tile. These are useful for animated live tiles with large photographic or information displays, like Sports or Weather.